Winter weather might have you thinking about heading to the mountains or hunkering down under the covers, but it has us planning for spring 2019! 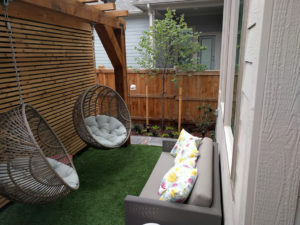 We’re excited about the trends emerging in landscape design. Here’s our list of the top five trends we expect to see in 2019. These ideas are set in stone and they’re beautiful! 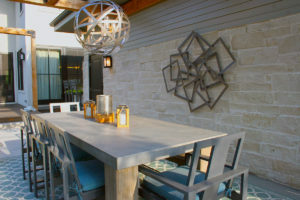 From natural stones to large format manufactured porcelain tiles, the newest finishes for outdoor structures and patios rival indoor finishes. We anticipate more bold ideas in hardscape this next year. 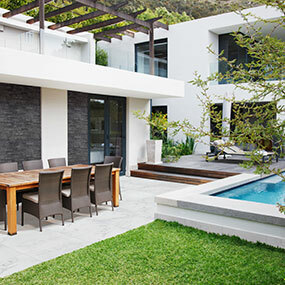 Many homeowners are choosing stone for its beautify and timelessness. Options range from granite to marble to sandstone for flooring, countertops and even accent walls. 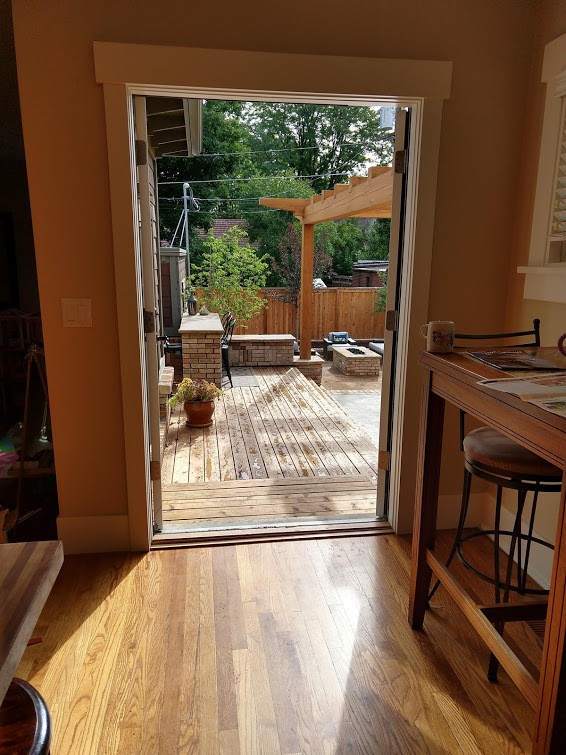 Another new trend is the inside/outside look of continuing indoor flooring to your outdoor patio, which can be seamlessly achieved with porcelain tiles. Who doesn’t want to feel like they’re on vacation all the time? 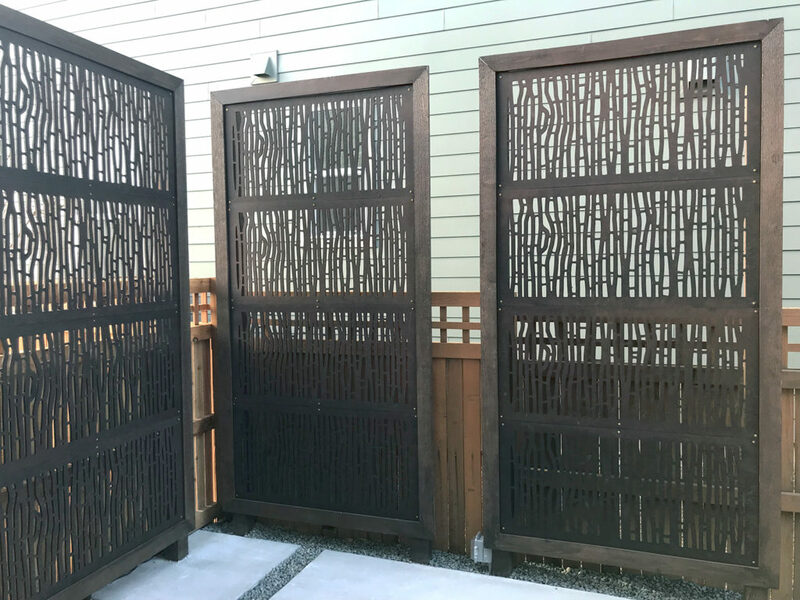 If your outdoor space is a haven for the senses, you’ll never want to leave. 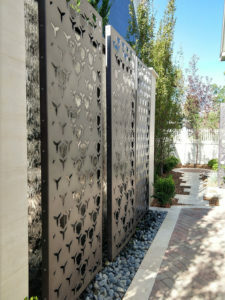 Water features create a visual and auditory delight and a place for your body and mind to reenergize. In 2019, we expect to see more water features, and complementary fire elements to create a destination of relaxation. We expect to see more indoor/outdoor living in 2019. 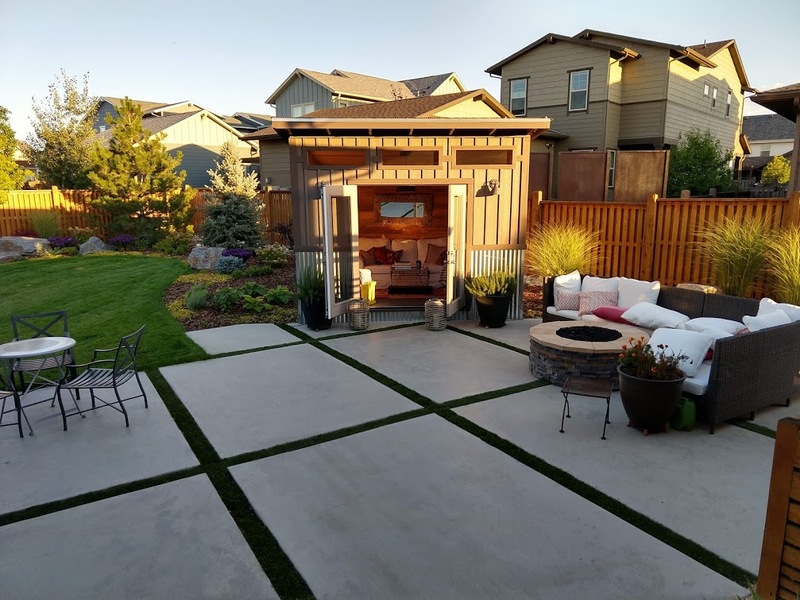 From indoor gardens that extend outdoors, to hardscape materials that compliment indoor décor, outdoor living has become a seamless continuation of life indoors. Multi-level spaces create a “room effect” and allow for private places to relax and retreat. Using a variety of high-quality materials, including hardscapes and modern lighting helps to create a design more reflective of a home’s architecture and distinct characteristics. 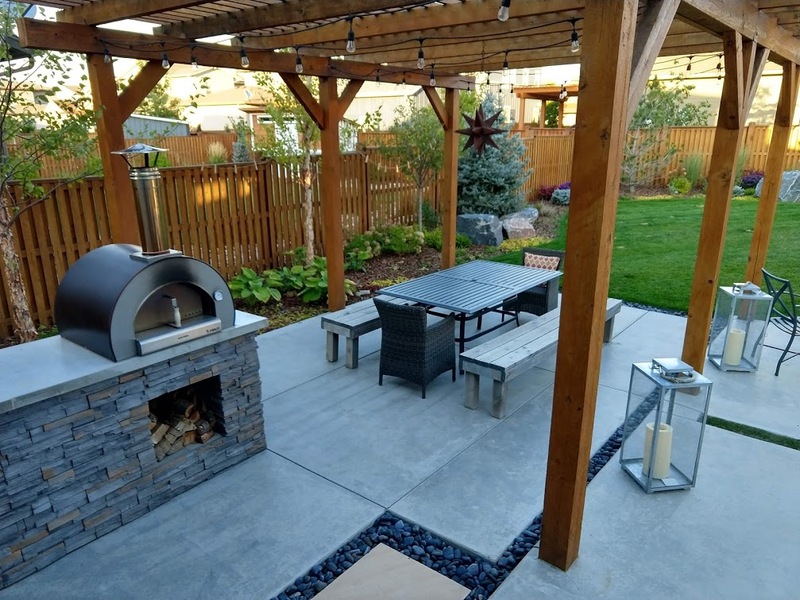 Outdoor kitchens have become an important focal point of many backyards. Creativity and functionality are key when designing outdoor kitchens. 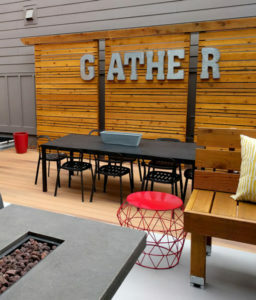 Trends in outdoor kitchens include sinks, usable counter space, built-in grills and bar seating. 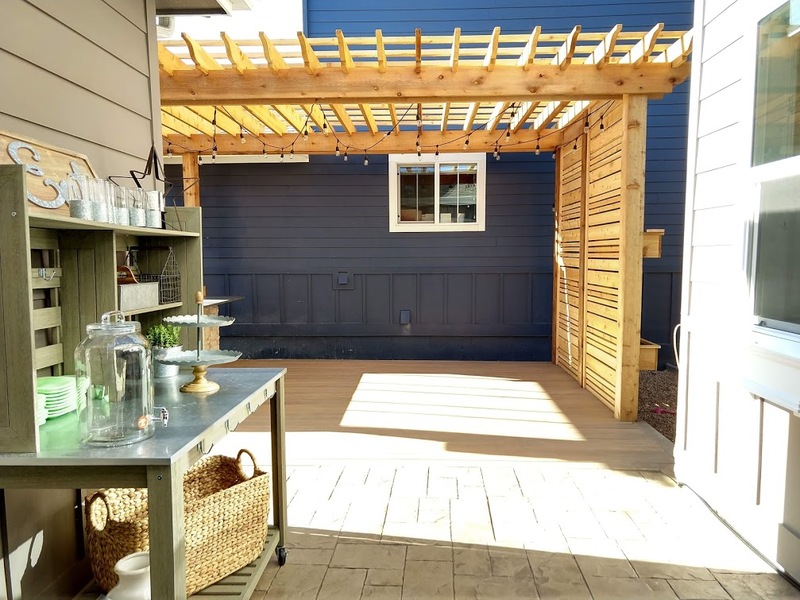 Other trends in outdoor kitchens include creating shelter over the kitchen area, modern lighting, and fun options like pizza ovens and kegerators. Would you ever want to come back inside? 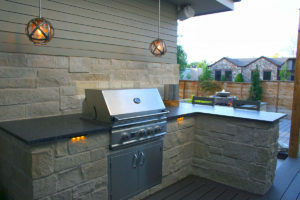 Counter space and lighting add beauty and function to outdoor kitchens. Adding a creative personal touch brings a sense of connectedness to outdoor spaces and often becomes a focal point for gatherings. 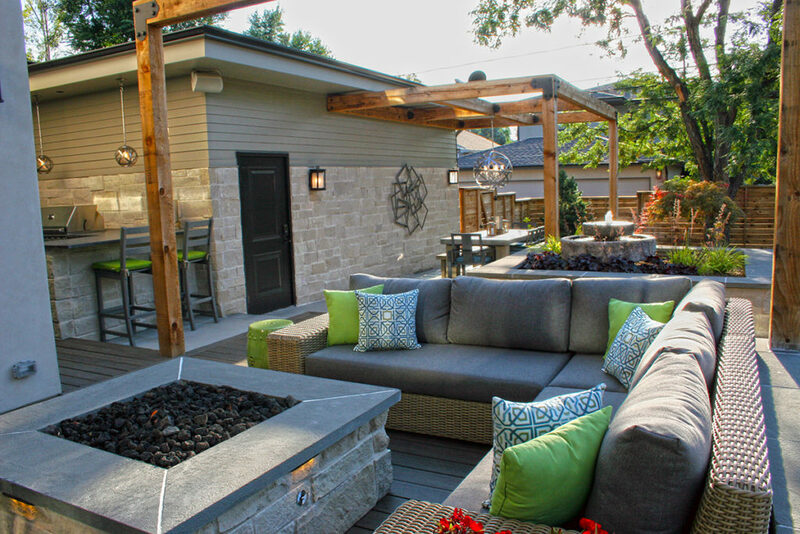 Creative designs often use water features or fire pits to entice the senses. A statement piece can add a spunky touch like a set of swings, a shed retreat, or a distinctive bar. 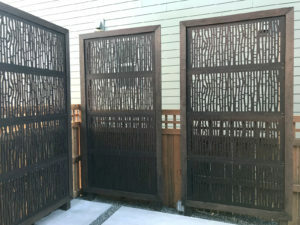 Using a decorative outdoor privacy screen and lighting can make an artistic statement in a small space. 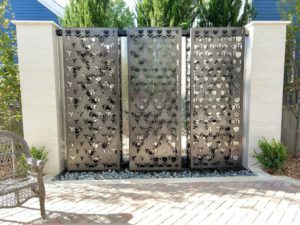 Custom water features add a element of tranquility and uniqueness. Bold lighting, metal artwork and candles can make an outdoor space special and inviting. Adding a unique statement piece can tie a space together and make it inviting. Functionality and fun can make your space uniquely yours. A small cozy shed creates a special retreat. 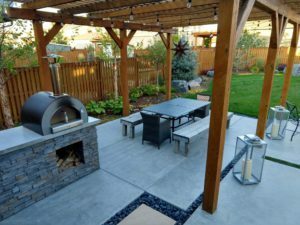 Adding a pizza oven to your space and lighting will make it a place for entertaining. Consider adding a hutch for personality and storage. 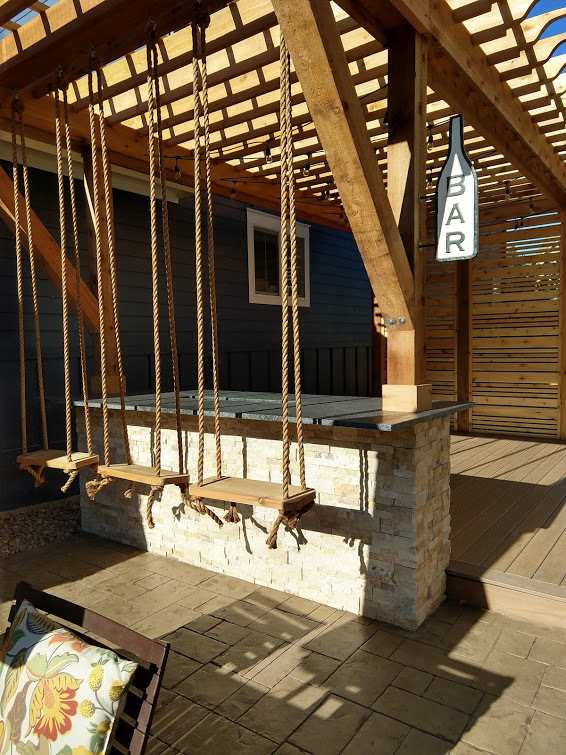 Swings add an element of fun to an outdoor bar.